Mad Max: Fury Road is the most senses-shattering fun an audience can have in a post-apocalyptic future you would never, ever want to live in. Dispensing with such trivialities as story or character development, director George Miller presses down as hard as humanly possible on the action throttle with blistering results. Mad Max: Fury Road is an action movie distilled into its purest form, filled with explosions, reckless abandon, visceral frenzy, and nightmarish sights and sounds one won't soon forget. This is the world of the Road Warrior, a bleak un-reality of dirt, metal, spikes, blood, desperation, and human beings barely recognizable as such. It is quite literally hell on wheels, and it is eye-poppingly spectacular. Tom Hardy is Mad Max, a former cop tortured by visions of the people he failed to protect when the old world ended in a nuclear war for oil. He sometimes is also mad as in angry. Captured and enslaved as a "blood bag," an unwilling human blood donor, Max finds himself in the closest thing to civilization we see in this world: the Citadel, giant buttes in the desert converted into fortresses, surrounded by a shanty town of desperate, starving, parched survivors. The Citadel is ruled by an aged warlord called Immortan Joe (Hugh Keays-Byrne), who drills deep into the earth for the water this world desperately needs and hoards it to make himself a god. When Imperator Furiosa (Charlize Theron) is sent in a war rig to a neighboring conclave to trade water for gasoline, she reveals she has other plans in mind. Furiosa has absconded with Immortan Joe's harem of "breeder" wives; let me tell you, that old scuzzbag Joe has been holding out on everyone because there are five incredibly beautiful, gossamer-clean women in this horrible world - Rosie Huntington-Whiteley, Zoe Kravitz, Riley Keough, Abbey Lee, and Courtney Eaton - and Joe had been hoarding them all. Whiteley is pregnant with Joe's child, but dreams like the other women of the "green place," the former home of Furiosa somewhere east, past the canyons and the endless desert. When Immortan Joe learns all the hot women in his life skedaddled, he rallies his entire army of Road Warriors to give chase, including Max, held prisoner as a hood ornament at the nose of his car. What transpires is an unbelievably grotesque yet painterly beautiful series of car chases; a smorgasbord of death and destruction escalating in utter insanity. Max manages to free himself and joins forces with Furiosa and her courageous, rebellious women, along with a young true believer (Nicholas Hoult) who simply wants to enter the chrome Valhalla as a great Road Warrior. Courting even more factions of grimy enemies to come after them, Max and the breeders eventually meet up with elderly survivors from Furiosa's former home, who are more than a match for these grisly demons they wage war on. 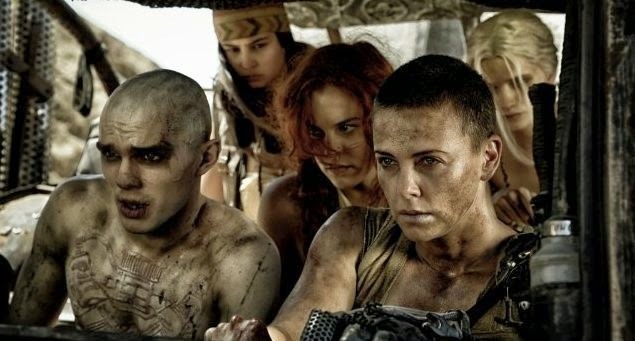 The big surprise is the welcome feminist bent Mad Max: Fury Road embraces as Furiosa and the women commit themselves to retaking the Citadel and ending Immortan Joe's rule once and for all. Max is more or less along for the ride, lending his skills to their fight as these women forge a place in this horrible world for themselves. Max himself is simply one of many hoping for a better path in this new world. Throughout Mad Max, the question is asked "Who ruined the world?" By the end of Fury Road, we're glad who runs the world: Girls.